My random discovery for today is so simple, I wish I’d known earlier. To make waffles that are light as air, use a dry mix — or make your own dry mix — that calls for adding an egg. Before you add your egg, separate it. Mix the yolk with the other liquid ingredients into the dry ingredients. In a separate, small bowl, whip your egg white until stiff peaks form. Fold the whites into the batter and use as usual. Your waffles will be so light and airy! Oh, try a teaspoon or so of cinnamon next time you make waffles too. It’s Shake ‘n Bake, an ah hailped! Shake ‘n Bake is a dry crumble coating that comes in a box and has been around since 1965. You put your crumble and raw chicken/pork/whatever into a big bag and shake it until the meat is coated. Then you oven fry it while you go watch the news. Beats standing over a deep fryer all night frying two pieces of chicken at a time, or spattering grease all over your stove while you are pan frying. It’s kind of a pre-convenience convenience food. It requires a little bit of effort, and those early cooks probably even wore their aprons while cooking with it. It’s not quite a box meal though, and you feel like you’ve actually cooked a meal when you’re done. The bonus is when you cook chicken this way, it comes out of the oven crispy on the outside and moist and tender on the inside. 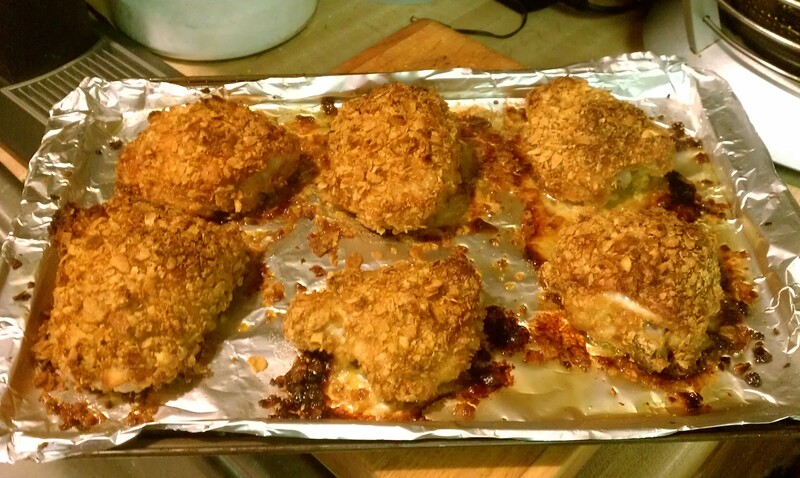 I hadn’t bought or thought about oven frying chicken in years; I usually deep fry. I spotted a sale on chicken drumsticks and thighs at the store this week for 99 cents a pound and after staring at two trays of thighs in my fridge and really, really not wanting to stand over the stove cooking them, I went hunting for a copycat recipe for Shake ‘n Bake. So what’s in Shake ‘n Bake? Turns out, not much after all. It’s crushed corn flakes and some spices and coloring. After a little Internet searching, here’s my version of a copycat Shake ‘n Bake coating recipe. Preheat the oven to 400F. Mix all dry ingredients together into a large plastic food bag, then lightly drizzle the vegetable oil into the dry ingredients and shake well to incorporate. Mix the egg and milk together and dunk two pieces of chicken at a time. 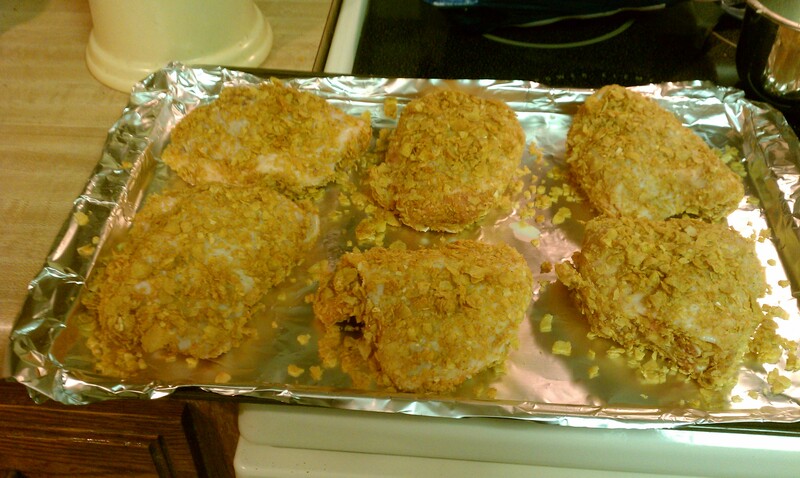 Shake off the excess liquid and then immediately place the chicken in the corn flake mixture. Shake the bag until the chicken is thoroughly coated (the flour is the important part of this, enabling the coating to stick, so don’t skimp on the flour in your mix). Place the coated pieces on an ungreased foil lined cookie sheet. Repeat until you have all your chicken coated. Bake 20 minutes for boneless chicken and 45 minutes for bone-in chicken pieces, or until the juices run clear. Occupy yourself surfing Facebook while you wait. Bonus tip: if you line the cookie sheet just right, you don’t even have to wash it when you’re done. Winning. My 17 year old loved — I mean loved — this stuff. He used the words “tender” and “juicy” in a coherent sentence to describe it. My husband also raved over it and said it was just perfect. I was reading comments on the Web, and lots of folks premake their mix and store in a sealed jar in their pantry. 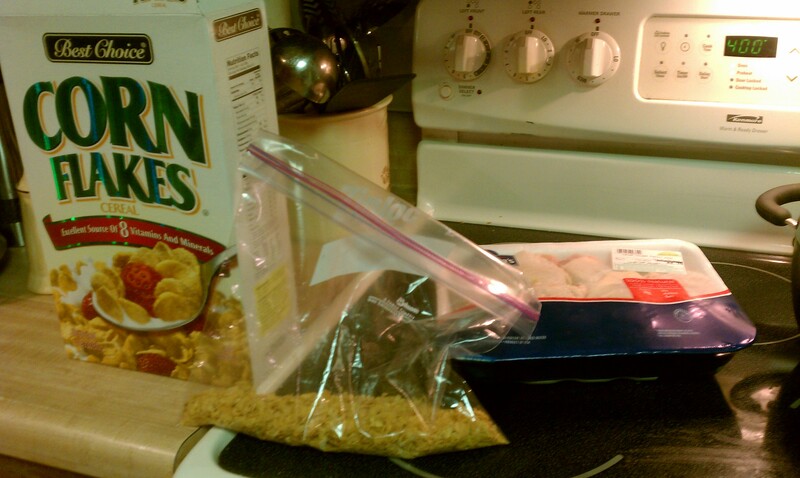 Seems like if you don’t have a lot of other uses for corn flakes and you don’t want to waste the rest of your box, that’s a really good idea.